How to Recover From Sexual Assault Injuries | Hupy and Abraham, S.C.
You have been hurt in one of the most intimate and devastating ways possible. As you struggle to recover from your physical and emotional injuries, you may be frustrated to learn that the person who attacked you does not have the money or the ability to pay you and that your time to pursue any kind of recovery is limited. The property owner owed you a duty of care. The property owner breached that duty of care by failing to provide the reasonable security that another similarly situated property owner would have provided in a similar situation. You were hurt because of the property owner’s failure to provide reasonable security. You are legally entitled to recover damages. 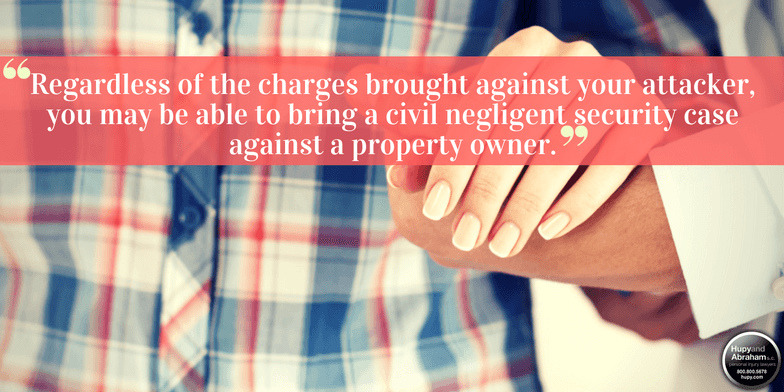 Regardless of the charges brought against your attacker, you may be able to bring a civil negligent security case against a property owner if you can prove your case as described above. You deserve to recover from significant physical and emotional injuries suffered as a result of negligent security, and you deserve to have an experienced negligent security lawyer help you. You can expect that the property owner’s insurer will argue that the security that was provided was reasonable and that the only one liable for your injuries was your attacker. You should not have to bear the stress of fighting your claim alone. Instead, you should be focusing on your physical and emotional recoveries while your attorney focuses on your financial recovery. To learn more, please start a free live chat with an experienced lawyer today or call us at 1-800-800-5678 to schedule your free, no-obligation consultation. Posted on 08/23/2017Is Your Child Safe at School? ?I was attacked at night on a property that was not well lit. Does that mean that the property owner is responsible for paying my damages in a negligent case? ?I was recently attacked and there wasn’t a security guard or other employee around. Does that mean that there wasn’t reasonable security provided? ?How should I report a negligent security attack?